Quite a bit goes on in Tahiti during the month of July. A lot of it is aimed at Bastille Day, being French. However, the biggest event is the Polynesian dancing and singing competitions which take place throughout the month. 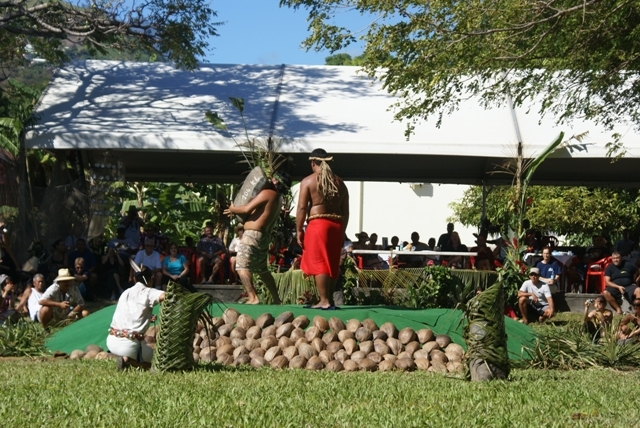 It is known as the Heiva and dance groups and singing groups compete in the main open air theatre in Papeete. The dancing is spectacular - each dance is choreographed to tell a story and lasts 20 minutes or more with up to 140 dances on stage. The dancers are all in Polynesian costumes (grass skits and the like) and there's a great deal of colour and vibrancy. We went along for 2 nights, but unfortunately you are not allowed to take pictures, so the following are the local sports that did take place around Bastille Day. Racing outrigger canoes is still big here and we saw a lot of practicing. They vary in size from one-man up to 14-man canoes. Women and juniors also have their events. 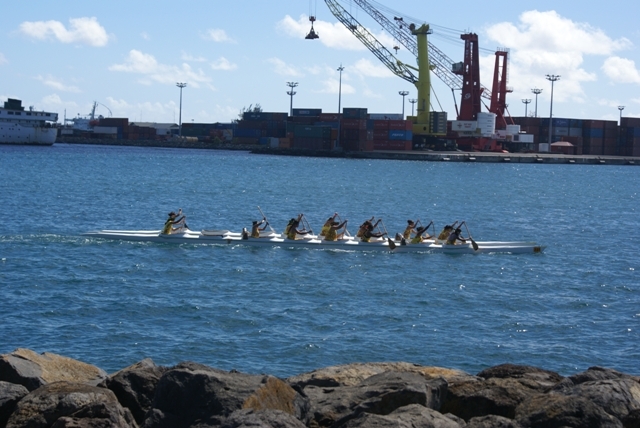 The big day - racing along the waterfront in Papeete. 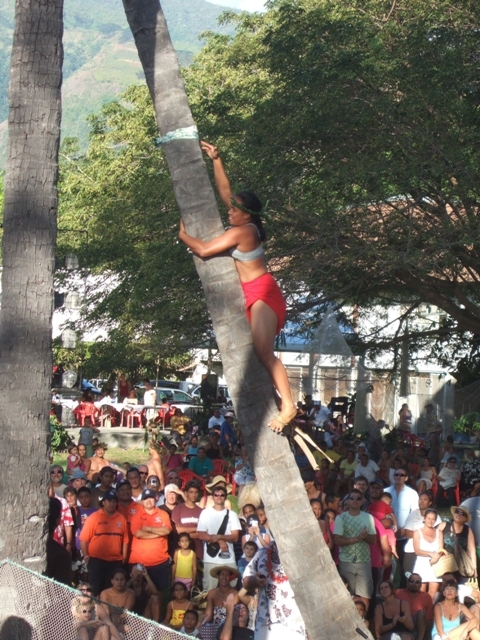 The local Polynesian games also took place on Bastille Day. 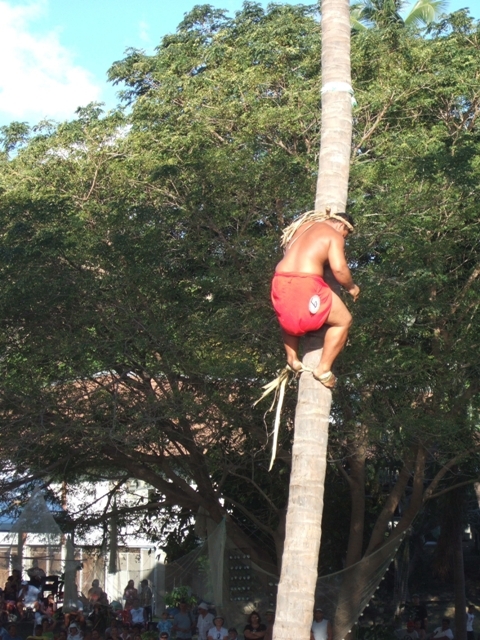 It included weight-lifting Polynesian style, climbing coconut trees, copra processing (shelling coconuts) and javelin throwing. Weight-lifting - picking up huge stones to shoulder height. 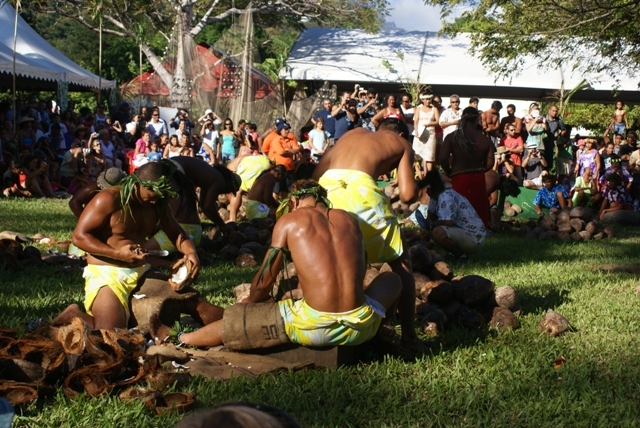 Coconut processing - one strips the outer husk and 2 crack the nuts open to get the white flesh out.